Large vessels have many systems that require control and monitoring. As almost every system comes with its own control panel and display, there can be so many on a bridge that the operator could lose the overview. Böning has developed detailed, sophisticated, and user friendly displays that are tailored to the customer. 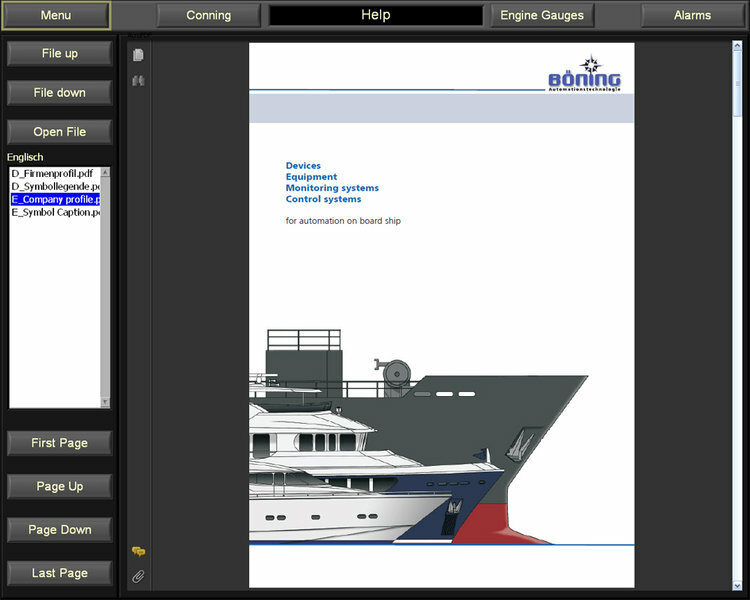 The data is graphically rendered and visualised by integrating them into the original ship graphics and master plans. 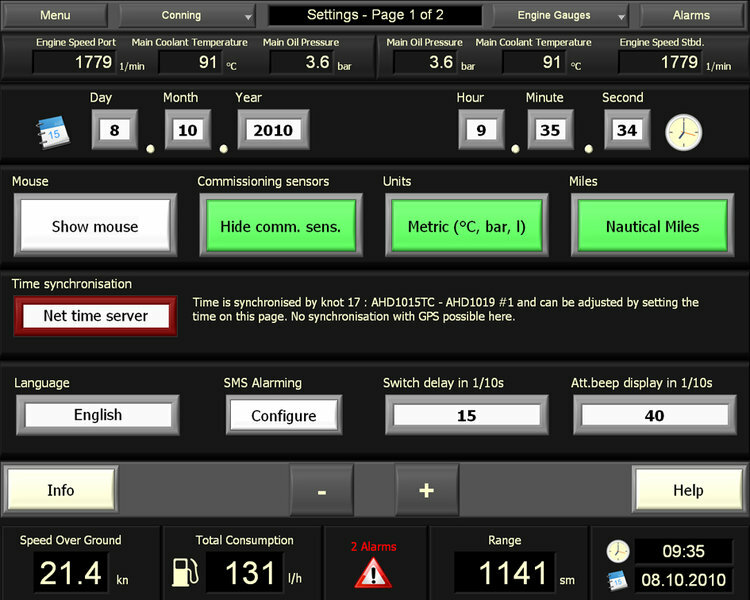 Commands can be transmitted to the corresponding units via touchscreen technology or separate control units. Böning’s monitoring and display system allows for the capture and visualisation of a multitude of sensors on board a ship. The monitored data is compiled according to the customer’s specifications and can be expanded to nearly any number. 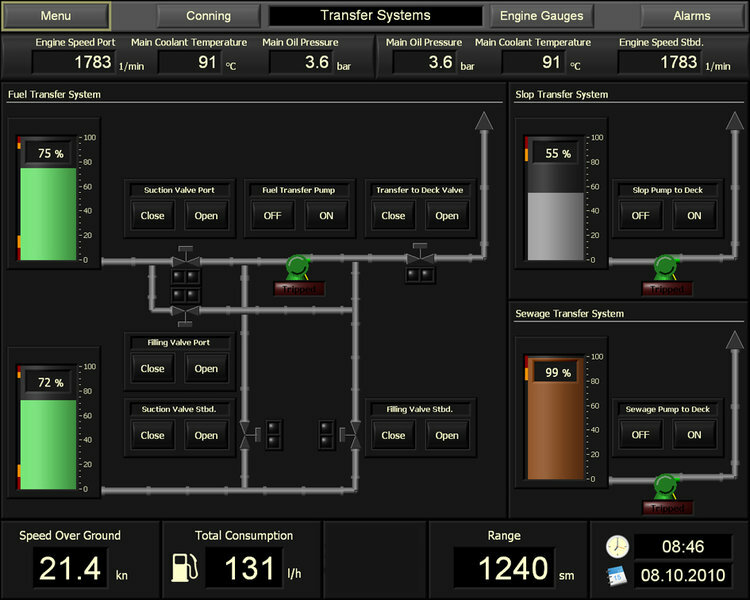 Depending on system size and scope of delivery, various functions can be displayed and controlled. A menu page shows all pages available on the system. You can directly access the desired page. 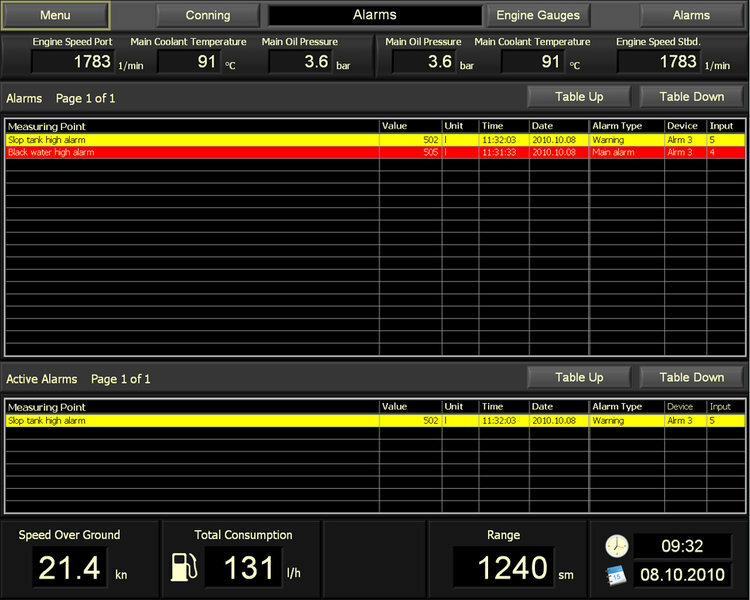 Every page shows the most important engine data in special rows providing the operator information about the vessel status at any time. 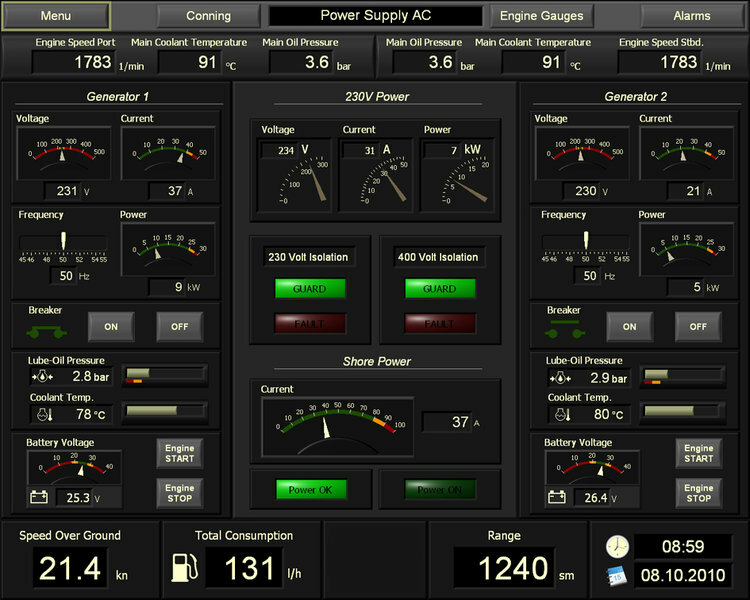 Various displays can be operated simultaneously, visualising all kinds of system data. The operator can still select the pages needed with just a push of a button. 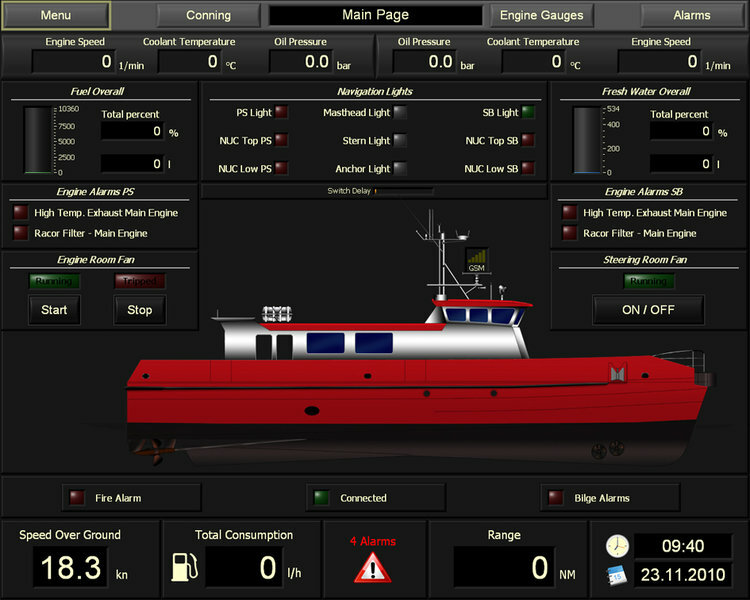 When underway, the vessel’s operator needs a general overview of critical system information. 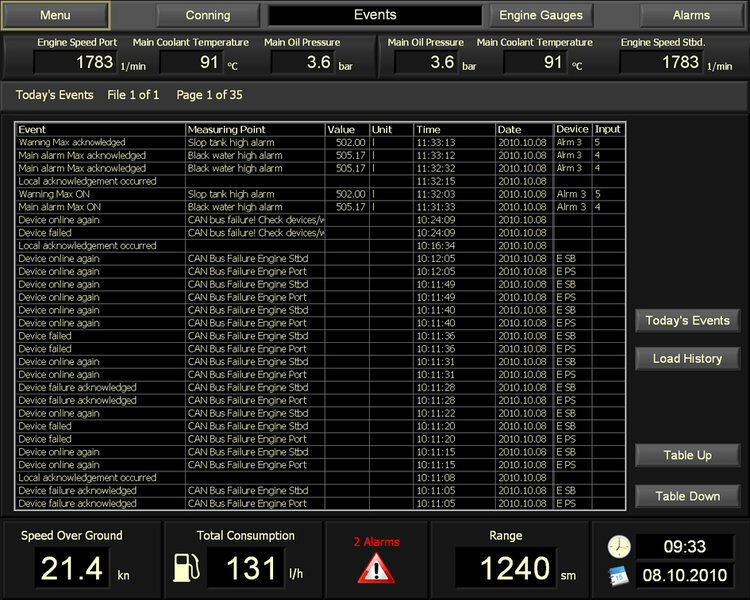 The main page shows main engine data, alarms, status of navigation lights, speed, range and other information so the operator can see the most important values at a glance. 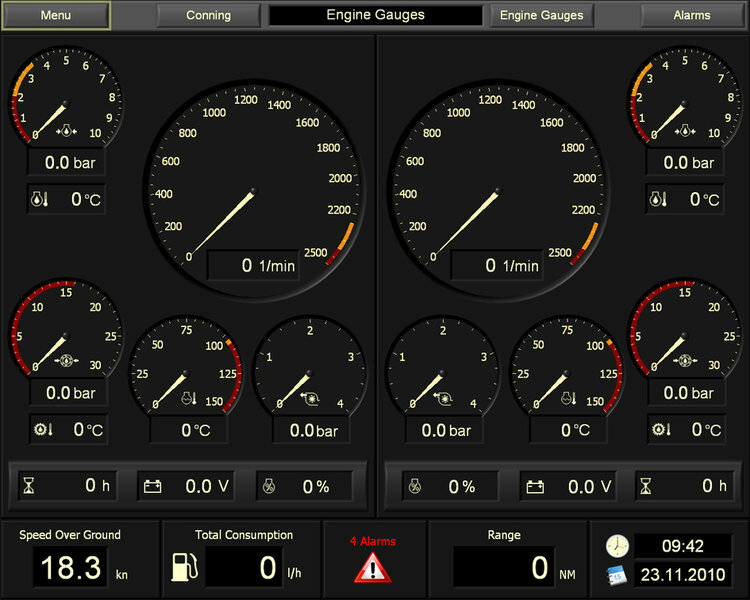 The display provides information on the engine status for the operator using the most common display methods. Information is presented in bar graphs so the operator can see if critical limits are exceeded. Any values beyond default are indicated by different colours; yellow for warning, red for alarm. 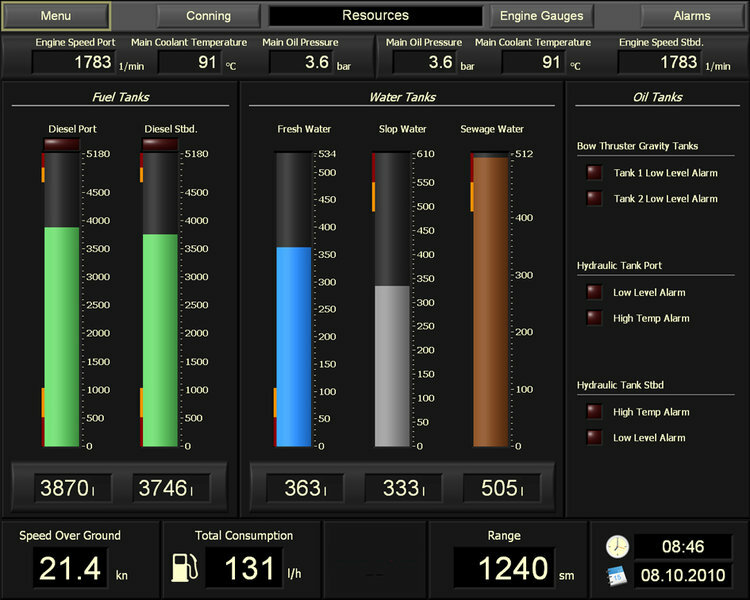 A vessel requires fuel, water, oil and further resources, most of which are in tanks. Bar graphs are the most effective way to show tank filling states, informing the operator when a value is beyond default. As the fuel is used in the vessel engines, this needs to be processed in advance. The transfer of the raw fuel to the daily tanks is an important task. The display covers the complete system. 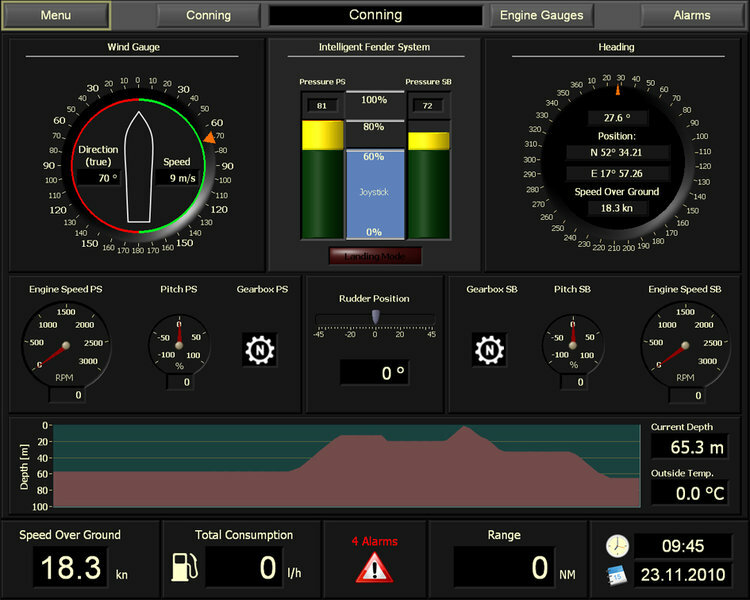 A display gives status reports for each bilge pump in the different areas of the vessel. Battery status is vital information. 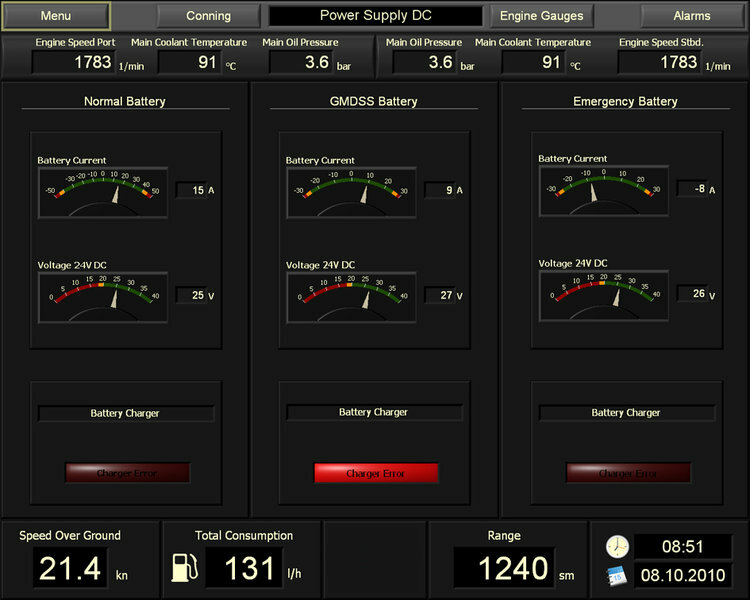 On this page, information about DC voltage and current values, as well as alarm conditions and malfunctions, is displayed. Keeping the energy balance on board a vessel is essential for functionality and safety. Failure of the generators leads to subsequent system failures, and in the worst case, to a NUC situation. Monitoring the generator states is an important part of the bridge crew’s duties. A logical and simple to understand display makes the task easy. International shipping regulations require constant supervision of the navigation light system. 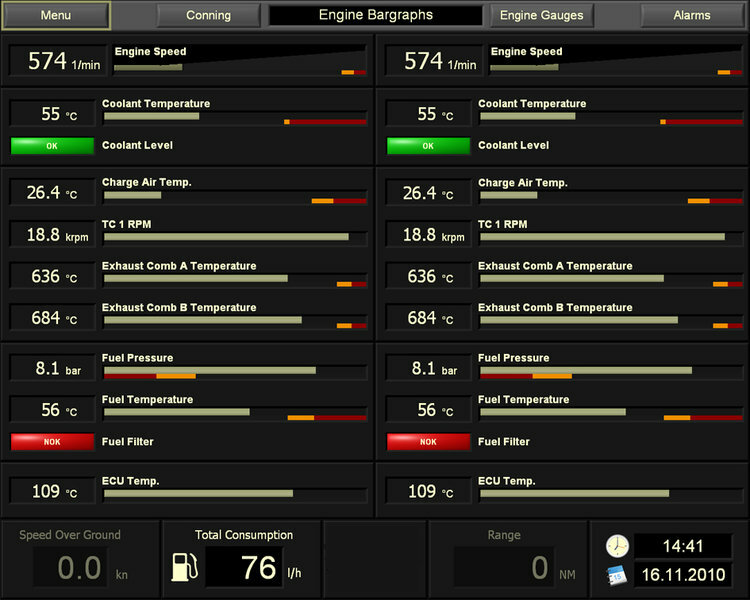 A visualisation on a display offers many advantages compared to mechanical displays, providing information about lamp status, error indications and many more. In combination with the navigation light monitoring system, the operator has a comfortable, reliable and type approved system at their disposal. Conventional bridges have the many displays for position, wind gauge and other similar information spread widely over the panels. Placing the data on one single page makes it easier for the operator and helps them react quickly if an emergency situation arises. Being aware of what is happening on-board or around the vessel is important. 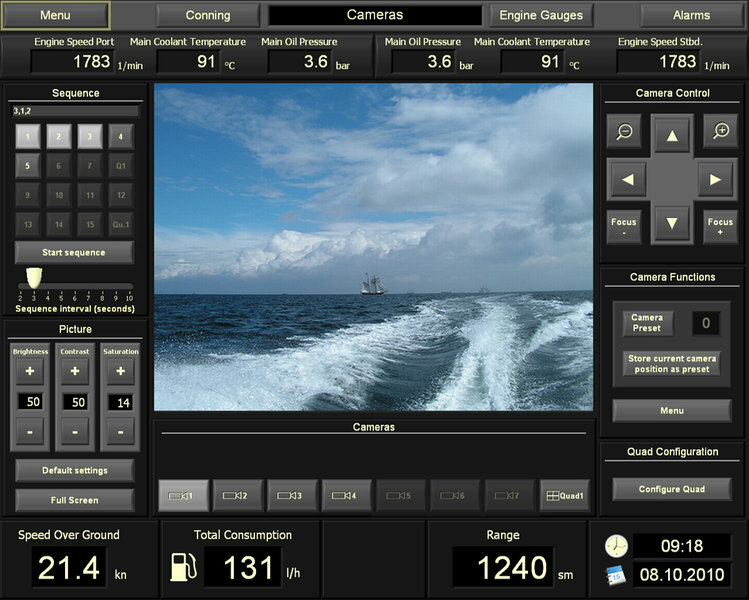 Where cameras are placed around the vessel, a display can show each area with up to four camera pictures displayed simultaneously for maximum security. This display provides efficient lighting control and monitoring from a central point. In case of a failure, the operator has to be informed immediately and provided with as much information as possible regarding the failure. 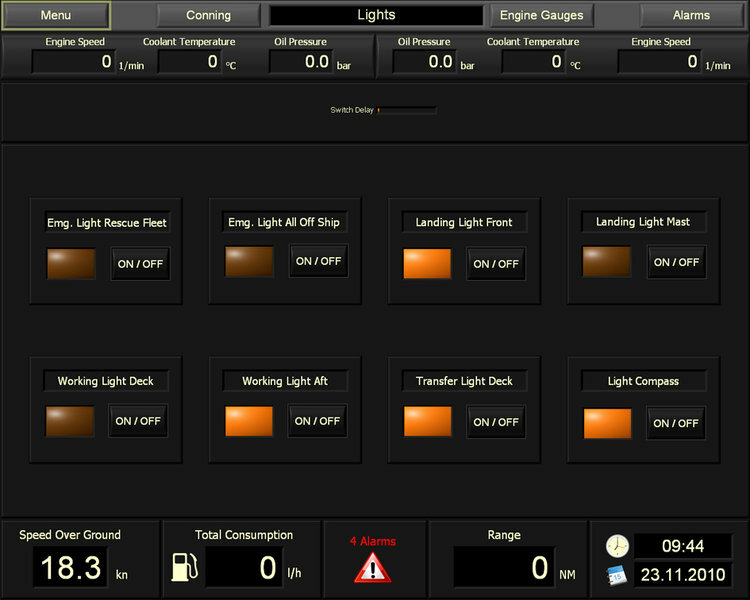 A key feature of the visualisation system is the presentation of alarms with additional information on a dedicated page. 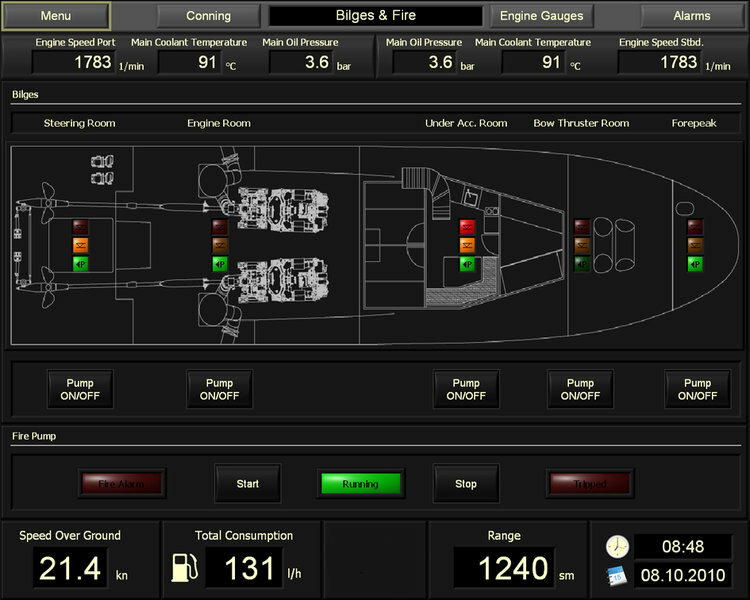 The operator can now help crew members find the cause of the alarm and deal with it. All events that occur during a specified period of time are displayed in a table. The operator has a continued overview of all events. The display allows scrolling in the contents, to switch between current and older events and even between the event pages, at the push of a button. 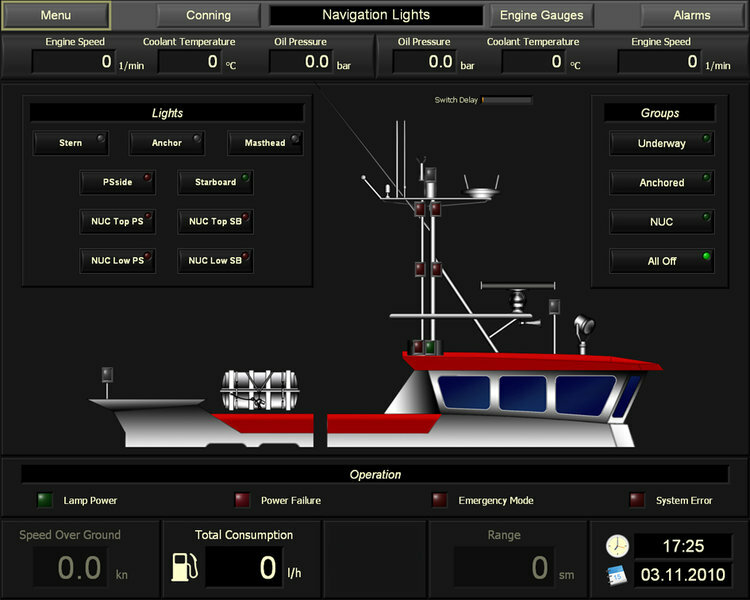 These visualisation systems are designed for serving on vessels around the world. A broad range of settings allows the system to be configured according to operator’s requirements. There are user manuals, troubleshooting guides and other items required for the operation of the system.